I like how the video is 4:20 in length. Peace! No Orcas. Daggumit anyway. Peace and Love. Please keep on keeping on. Excellent info. Loved the videos as well. Watching from Victoria, Australia where we are “enjoying”? a heatwave…..I am familiar with the area as my sister lives at Gibsons….thanks so much for the wonderful footage…. 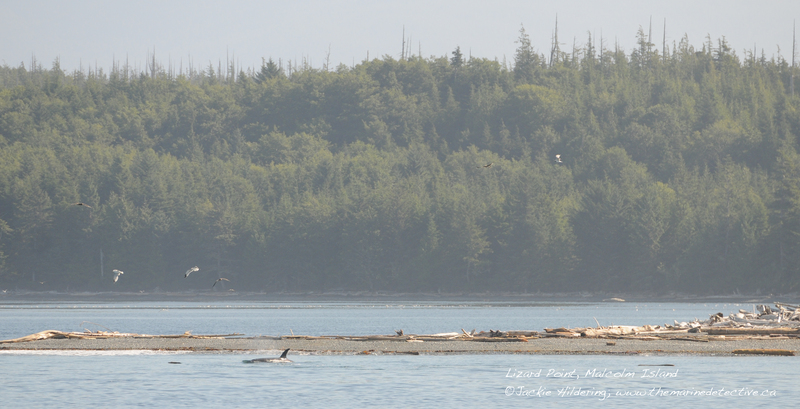 I have seen this from Dr Paul Spong Orca Lab and ALWAYS love seeing this behaviour. Mom Dad and calf. Hello Sylvia. You’ll note that the one video in the blog is from one of OrcaLab’s cameras. Note though that this is not mother, father and calf. This is not how how the social structure of “Resident” Orca works. 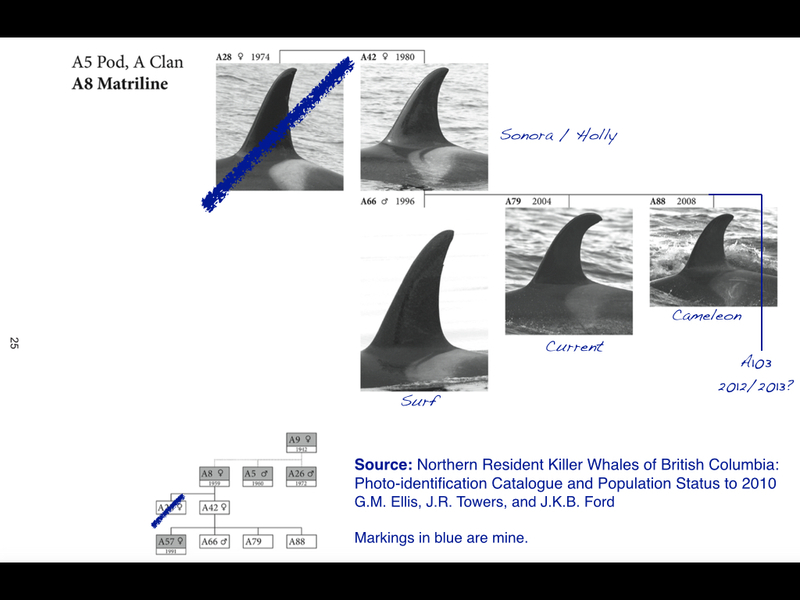 Have a look at the matriline / family tree in the blog to see that Surf (the mature male) is a son, brother and uncle but NOT a father to any of the whales with which he is travelling. So, a friends FB feed led me here to read your post. Something about the way that big finned mammal got so close to the part of the world we bipeds dominate just pulled my curiosity. Thanks for doing, and particularly sharing, the research into their behavior with us. I hope the world at large does a good job of providing for your happiness as you explore and share existence for our collective edification. I feel that everything existing is part of the same thing. I’m not a scientist, I chose construction as my gift to develop and share with the world. But I love curious minds and while I have hours every day watching my hands do the same old thing they’ve done so many times before, I’ve developed the habit of postulating things. Or being an opinionated butthead if you prefer. 🙂 I prefer to think I’m playing with possibilities. Initially, in the FB video I saw a mammal, built differently than us, lazily cruising along the edge of it’s known world. Close enough to shore that it could experience both the sustaining air above it’s usual world AND the earth beneath it’s world. Neither of which he could directly experience with the constraints placed on him by having been born into a body best suited to living in the ocean. developed flippers into feet! Maybe evolution didn’t just accidentally happen, it was the result of life’s desire! Or maybe I’m just projecting. Who knows? You sound educated. Did your course of study ever offer an opinion as to how far that collective thought had gotten toward actually thinking they knew what motivated the creature’s desire to be in the three worlds at once? What is the current level of hubris in the educational community? How much time has your mind spent trying to figure out how to fund your research into how to devise a test to determine what the motivations of this alien species is? Sorry if this comes across as anything other than a request for more of your offered knowledge, I’m just interested in things and want to thank you for taking the time to put it out here for the rest of us. Hello Kinetic Arts- Your comments and questions make me believe we would have very interesting conversations. Forgive me however, that I have limited opportunity to reply now. What you share is thought provoking of course and, while not wanting to force it into a box, I perceive to be in the realm of ontology. I believe I can best invest my efforts into attempting to generate respect for other organisms without making it all about us; to try to generate connection and wonder without it feeding the kind of spirituality that puts we humans at the epicentre of the universe. This is an insufficient answer but, hopefully, along with the other content and efforts of “The Marine Detective”, gives a sense of what I have to focus on.